The original DOVPO Topside Dual 200W Top Fill TC Squonk MOD appeared on the market and was the first squonk mod where you could fill the squonk bottle from the top of the mod. The original DOVPO Topside Dual 200W Top Fill TC Squonk MOD appeared on the market and was the first squonk mod where you could fill the squonk bottle from the top of the mod – saving the messy business of pulling out and pushing in squonk bottles. Apparently, the original 10ml Topside squonk bottle and sled are also compatible with the dual version. The kit includes 2 squonk bottles too. There is a 0.96in OLED screen and you have Variable Wattage and Temperature Control (Ni, Ti, SS) user modes to choose from. • You can check other squonk mod in BuyBest. Before writing this comment I wanted to test the mode for a few days at least to have a clear view of it's performance and wow, I'm impressed. I was looking for a 2 batteries squonk mod with a regulated board for a long time. All I saw on the market did not impressed me or was too expensive. When I saw the Topside dual I said to myself : "this should be it" and I was wright. After watching a lot of revies and users comments I decided to purchase it. I checked a lot of platforms and the best price found on BuyBest so I placed the order. 1.Ordering was very easy and fast. 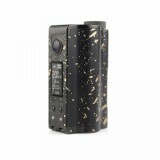 With the discount and coupon the price was very nice and they also gave e portable mini camera as a present. 2. Delivery. When I placed the order, the product was on pre-sale and it had to be shipped in 15-30 days so I was ready to wait. What was my surprise when, after just 16 days I already received the mod. It was super fast and unexpected. I have ordered a lot of product from different platforms but never had such a quik delivery. Thank you BuyBest for that. Tracking number was working and I could always check the shipment status. 3. The product. There a lot of things I can say about this mod since it's a winned. It came very well packed with no dammage. When I first got this mod, it was pretty much what I was expecting. It’s quite a bit thicker tehn the original Topside due to the extra battery compartment, but outside of that they look pretty similar. This one comes with the updated firmware already installed to have all the modes on, and does not require an update to unlock the temp control and other modes, as was the case with the original Topside. 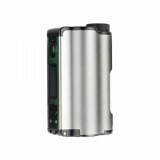 The Dovpo Topside is a very nicely built and well-designed mod that is quite comfortable to hold in the hand. 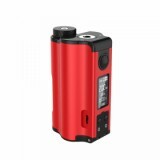 It is big and heavy though, larger than most of the dual battery squonk mods on the market. I don’t mind the size and weight at all personally, but it’s worth noting for those who prefer smaller and lighter devices. In fact, any dual-battery squonk mod is going to be a bit bulky just to be able to fit the two batteries and the squonk bottle in it. The shape is very ergonomic and it’s also easy to squonk with your middle and ring fingers. It can even be squonked while vaping on it, so great design there. What sets apart the Topside mods from competition is the top-fill mechanism, which is very convenient and is just like filling up a tank. Very practical and much less messy than removing the bottle to fill. The squonk bottle is larger than most at 10 mL and the great feature is that they give a spare bottle in the package. Squonking works pretty slow here what might be a con for someone but it's a winner for me. This way is very difficult to oversquonk and make you RDA leacking. There are fiew minor cons though: 1. Size. It is big and heavy and might not be for all users but despite the size, it feels very well in the hand and after just 2 days using it I got used no it. 2. Squonk bottle is covered on the top and on the bottom and you can't see when the bottle is full or empty. 3. The battery compartment door is a bit disfficult to close. I have never seen a perfect device so far and this one is no exception and this is normal. But the cons it has are so unsignificative that I don't even consider them as cons. I vape 7-8 ml per day so this mod with 10ml of e-liquid lasts me all day. Toghether with my favorite RDA it gives all I need from vaping : best flavor , best performance and best battery life for all day long. Overall , I can can recommand this mod if the cons mentioned above are not important for you and the best place to purchase it is BuyBest. This is a truly excellent squonk mod after almost 1 month of daily use. Powerful, super easy to refill and very sturdy build quality. No leaking issue so far. Works great with my Wotofo Profile RDA. I highly recommend it. Fast delivery... received mod in 1 week to Malaysia. 2 months waiting for this product due to several problems but it was worth the wait !!! 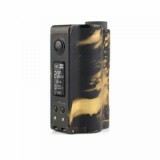 This squonk mod is really the best dual 18650 on the market, easy to use, simple to fill and doesn't use much energy. It just take one week to my country, and it is original, I recommend. I highly recommend this powerful MOD. Power enough for my vaping, the seller is good. This color is good and i like it. The delivery took about 2 weeks, and after using it for 2 months, it is very comfortable and good. However, I would feel lacking if I did not use batteries that are over 20700. I've used the emulsifier with Hadeon, Drapsolo, Capstone, and profile. I've tried it and it's the best. I am using it with satisfaction. Awesome duel battery mod. Great quality and the battery door doesnt move at all. Very nice centered 510 without a gap. Buttons, chip, and screen very solid. I would buy this again over the Drag. Love my single with the 21700. Can't wait for this dual one It's more powerful than the original Topside. I'm sure many vapers will like it and I'm gonna order one.